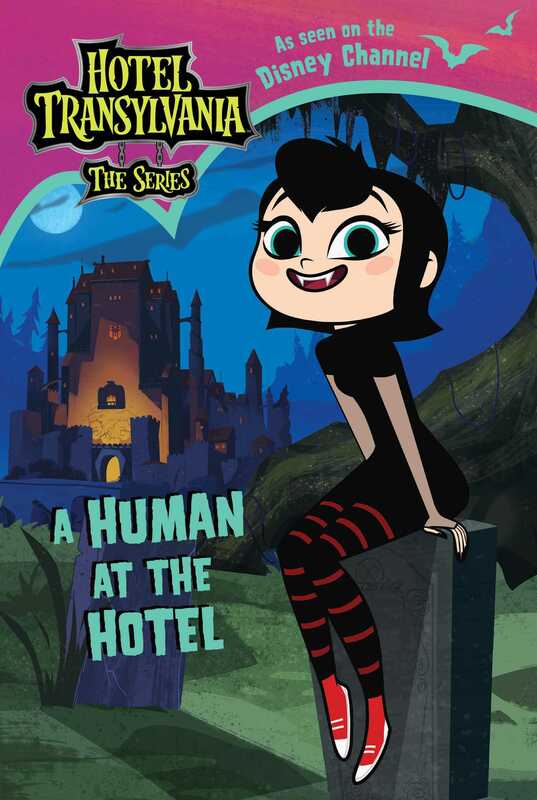 There’s a human at the monster hotel in this hilarious novel based on the first episode of the hit Disney Channel show Hotel Transylvania: The Series. Count Dracula’s daughter, Mavis, is a lot like any other teenager: She wants to be taken seriously! So when her father has to leave Hotel Transylvania—the monsters-only hotel he built as a safe haven free of humans—Mavis thinks it’s her big chance to prove to him that she can run the hotel all by herself. How hard can it be? Unfortunately for Mavis, Drac calls his sister, Mavis’s Aunt Lydia, to watch over Mavis and the hotel while he’s gone. Worse, Mavis mistakenly lures a human to the hotel. Can Mavis get the human to leave before Aunt Lydia finds out? Mavis Dracula wasn’t an average teenager—she was a vampire teenager. That meant she could do lots of supercool things, like turn into a bat and fly through the air. But being a vampire wasn’t all fun and games. Mavis wasn’t allowed to go out into the human world, and could only hang out with other monsters. That was because her father, Drac, thought humans wanted to destroy all of monsterkind. He had built the Hotel Transylvania—a hotel just for monsters—to keep Mavis safe. Since it opened, no human had ever been inside. There was no safer place for a monster to be. But Mavis wanted freedom. One day, when her father had to leave the hotel to meet with the Vampire Council, Mavis thought she would finally have the chance to be in charge of the hotel. She was wrong. Drac called upon his sister, Lydia, the Dark Baroness, to watch over Mavis and the Hotel Transylvania. Unfortunately, Aunt Lydia was even more strict than Drac . . . and scarier too! Mavis had just rescued her friend Wendy the Blob from being stuck inside a ketchup bottle when she heard some interesting news. Mavis couldn’t believe it. Scream-Cation was a very important travel newspaper for monsters—and Gretchen Squib was a tough critic! “One bad review and she can sink the hotel!” Mavis said. “Aunt Lydia demanded that I ‘maintain order’ so nothing goes wrong. Which really just means, ‘Do nothing,’?” Mavis said, pouting. “But . . . you’re not going to do that?” Wendy guessed. Mavis got right to work on her hotel improvement project to get everything ready for Gretchen’s arrival. She spotted a nearby door that was nailed shut with unsightly pieces of wood, and started to pry them off the doorframe. “Not that I don’t totally believe you, Mavis, because I do, but this sounds like the kind of thing that always blows up right in your face,” said Wendy, watching as Mavis struggled to pull off the last piece of wood. “Oh, come on. How’s this going to blow—” Mavis started to say, but before she could finish, the door flew open and she was almost trampled by a pack of werewolf pups that came running out of the room! The wolf pups barreled down the hallway and ran into a nearby zombie bellhop pulling a pile of suitcases on a wooden cart. The suitcases flew in the air . . . and when they landed, the zombie’s uniform had been replaced with a hotel guest’s pink bathing suit and pearl necklace! “Huh?” the zombie bellhop moaned, confused. Mavis didn’t have time to laugh at his new clothing. She raced after the wolf pups, hoping to catch them before Aunt Lydia did. Another shrunken head decoration felt the need to comment on Mavis’s plan when she ran by its door. “Totally going to blow up in her face,” it said matter-of-factly. But Mavis was already gone!